Landschaftsausflüge am Sil Canyon, Galicien, Ribeira Sacra, Spanien. The view-point of Vilouxe is located at Picouto on the road from Alberguería to Parada do Sil, nearby the village of Vilouxe. 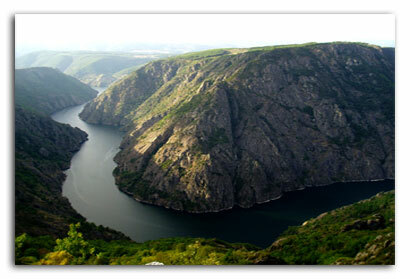 Here you one can enjoy a spectacular view of the Canyon of the river Sil. The "Balconies of Madrid" are situated at Torgas/Parada do Sil and offer a view of the Sil meandering through mountains showing exhuberant vegetation from a considerable height. 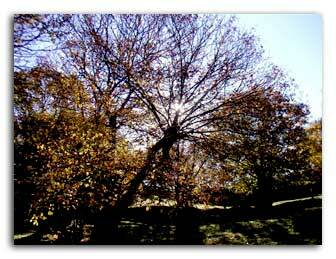 This natural view-point is located on the road from Parada do Sil to A Teixeira. You can enjoy a view of the river Sil with the vineyards prevailing which were built on terraces on both sides and the village of Barxacoba. From the village of Xirás on the road which connects A Teixeira to Valilongo you can see the village of Cristosende surrounded by a ring of various colours: the chestnut trees, vineyards and the river Sil. Situated at two km of A Teixeira at the village of Lumeares, this viewpoint is looks out to the valley of Abeleda and the remains of the monastery of San Paio. On the moutain road which connects Xunqueira de Espadañedo with Santigueiro, Couto and Coutiño you will enjoy a spectacular overall view of the Canyon of the river Sil.